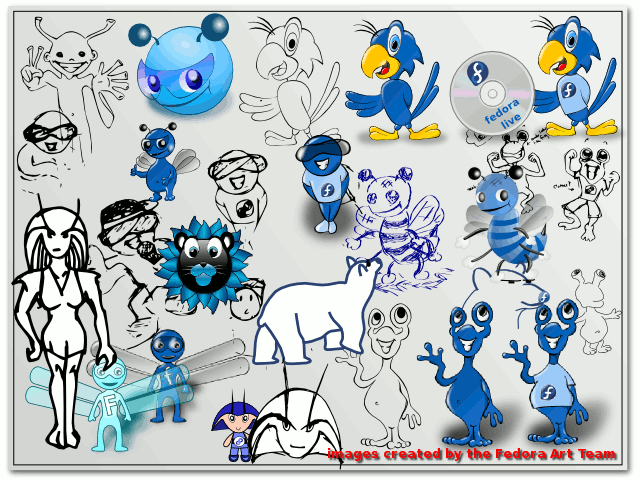 nicu's FOSS'n'stuff: Mascots and Fedora. Do we need one? Do we want one? I'd like to have a mascot, but the community should think hard what sort of mascot it should be (impersonating Fedora and not just any mascot). A mascot would be nice, perhaps. But what purpose does it solve? The only professional grade mascot there is the parrot, I like that. What purpose? I will quote from the wiki page: "brings a friendly personality to the project and reaches out to our target audience". A mascot is something funny and friendly, it help people identify with the project and also make the project look more human. On top of that, a mascot makes good material for t-shirts and plush figures. Indeed, the parrot is the only "professional grade", but this is mostly because other graphics are not finished and have not evolved beyond the "concept"phase. Personally, I think that if we were to keep putting focus on the Infinity logo, then that would get all the recognition Fedora needs to create a strong recognizable visual. That logo has been around for a few versions, and is what people probably recognize first, not some cutesy character. yes, the parrot with Fedora's T-Shirt is the best!